"A River Runs Through It..."....and what is "It"? "It" is my town. A large portion of the Nashua River runs right through the middle of my town. 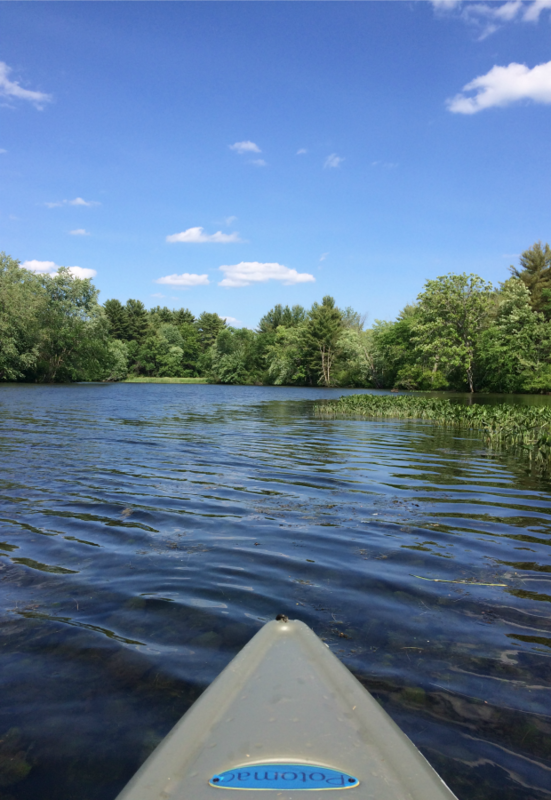 It is a lovely waterway, that lazily meanders north meeting the Merrimack River in Nashua. The town is also bordered by another river, the Squanacook. In addition, there are lots and lots of ponds and lakes, all within a 10-15 ride from my home. For years and years, especially as I've hiked along the paths of these waterways, I have been chattering to my family about how much I wanted a kayak. Finally a few weeks ago, after many weeks of scouring Craigslist, I finally obtained a kayak! It's 10 feet and only 40 pounds, so I can throw it in the back of my small suv any time I have some time to kill and I've been using it a lot!! There is a boat launch on the river only 3 miles down the road from my house, and it launches right into a watershed/oxbow area that is positively divine! The area is protected and the wildlife are flourishing there. As an amateur birdwatcher, I'm especially excited to get on the water and see all the wonderful waterfowl!!! Is there anything cuter than baby animals!?!?!?!?!?!? The only thing I worry about with my new hobby is finding time for my old hobbies! Hah! That's a joke of course, because I'll always find time for beading! 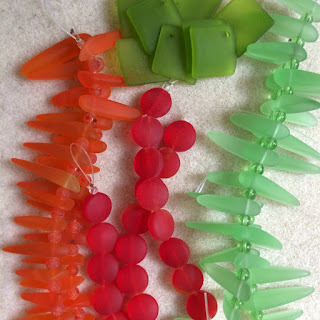 I recently received some fun cultured sea glass beads from ZNetShows to create something for their upcoming summer Creative Spark issue. The theme I will be working with is a little outside the box, but I'm looking forward to seeing if I can pull off my idea. Stay tuned for July to see the reveal. But imagine my delight, when I saw it matched this one just as well, if not better! And finally, the weekend before last I started tackling the Bead-It-Forwad squares! It is so fun to play around with these squares and turn them into quilts and crafted object! I love it! Coming up soon, I will be setting up an online bidding auction for some of the Bead-It-Forward products! I like the thought of kayaking in theory but I'm too afraid of capsizing and ruining my camera & phone that I don't dare attempt it ever. lol Can't wait to see what you do with the frosted glass. Your beaded set is gorgeous ~ what a bonus that it goes perfectly with two tops!!! And the B-i-F looks like it is really coming along. Cannot wait to see the auction pieces!!! p.s. Did your husband or Jackson get a kayak or is this just Mama time for now? I knew it, I knew it....we are definitely kindred spirits, I too have a kayak and love it so much. 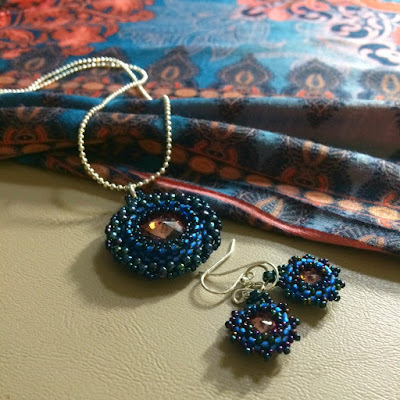 Awesome pictures have fun paddling, and your pendant and earring set is beautiful -brilliant match! Wow a kayak it sound like fun and looks that way too. Wonderful pictures of the birds, I agree the babies are very cute. I would be too afraid to go kayaking by myself here where I live there are too many dangers like snakes that fall into your boat and alligators that knock you over. 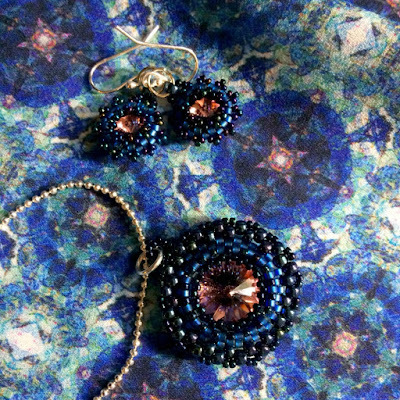 So I will stick with walking and beading, which by the way your pendant and earrings are gorgeous! I bet you can find more tops that they will go with in your closet, those colors will go with just about anything. Looking forward to seeing what you create with the sea glass. The BIF quits and other item are looking good. I hope they bring in lots of money for Breast Cancer research. Enjoy your kayak and stay safe.